these kaju katli are the way they are actually meant to be - thin, smooth, melt in the mouth slices of cashew goodness. 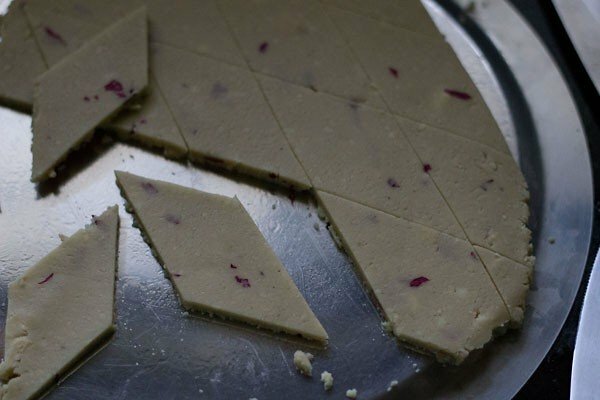 kaju katli recipe with step by step photos – these kaju katli are the way they are actually meant to be – thin, smooth, melt in the mouth slices of cashew goodness. ideally kaju katli should be thin and not thick like a barfi. the word ‘katli’ means ‘thin slices’. 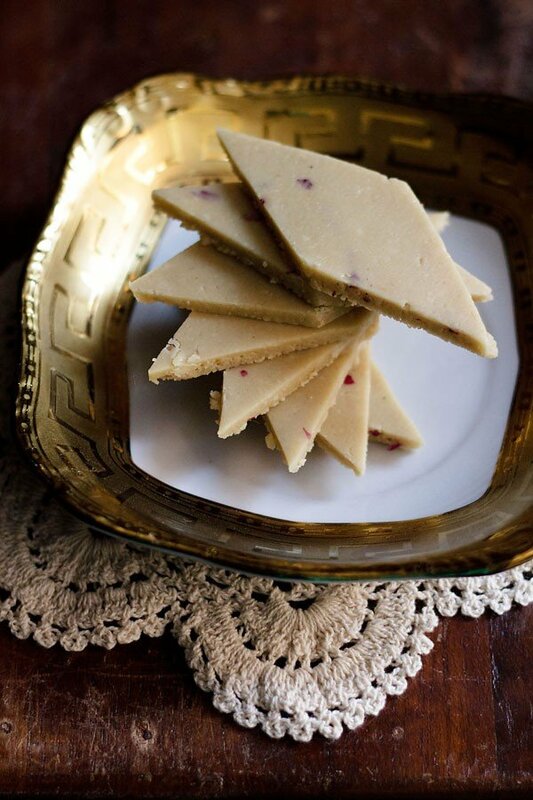 kaju katli (cashew fudge) is a most sought after indian sweet at home. whenever we get a big box of kaju katli at home, they just get over in a couple of days. 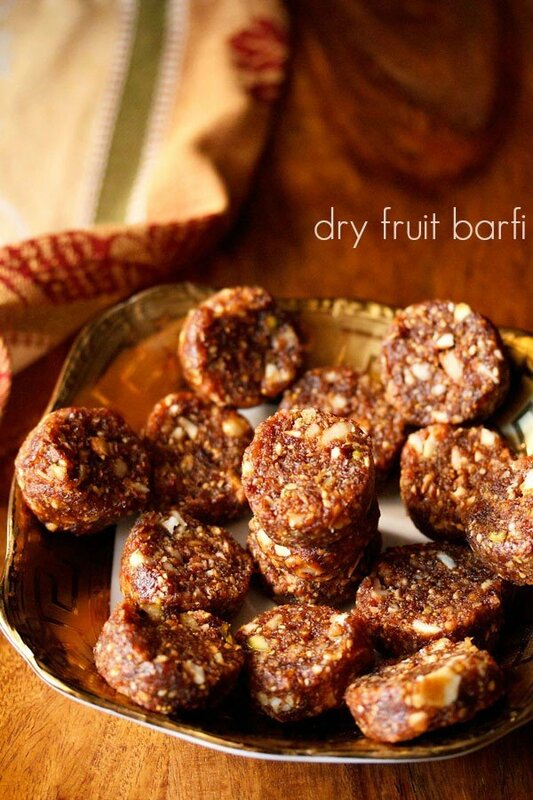 if you stay in north india then during diwali festival you might receive a box of kaju katli or dry fruits as a gift. kaju katli is one of the most popular sweets which is gifted to relatives and friends during the diwali festival in north india. from these disasters i learnt a few things that contribute to get a perfect kaju katli – the consistency of the powdered cashews, the consistency of the sugar syrup and cashew dough and why kneading the cashew dough is important. learning from my trials, i was able to develop this fool proof recipe of kaju katli. this step by a step post is a sincere attempt to share the method to get the perfect kaju katli at home. since i actually struggled with this indian sweet many times while making the other indian sweets were a cake walk. i have mentioned the tips and pointers in the step by step recipe details. i have also added fresh organic rose from my balcony garden in the kaju katli. this is totally optional and you can just skip it. if you prefer you can even add rose water or saffron. otherwise there are no flavorings added in the kaju katli. its just cashews and sugar. varak or silver foil is also placed on the kaju katli. since i don’t use varak, i have skipped it completely. cook the kaju mixture for approx 7-9 minutes till the whole mixture starts to come together. 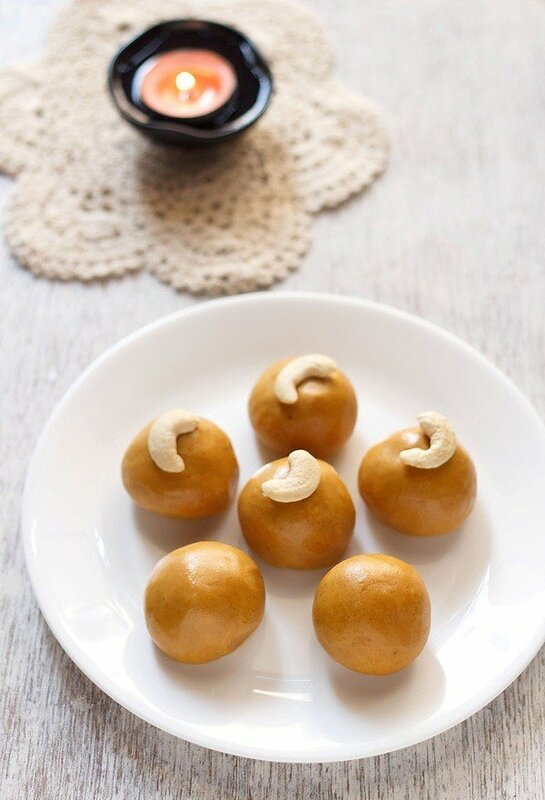 remove the whole lump of the kaju mixture from the pan and place it on work surface, bowl or plate. 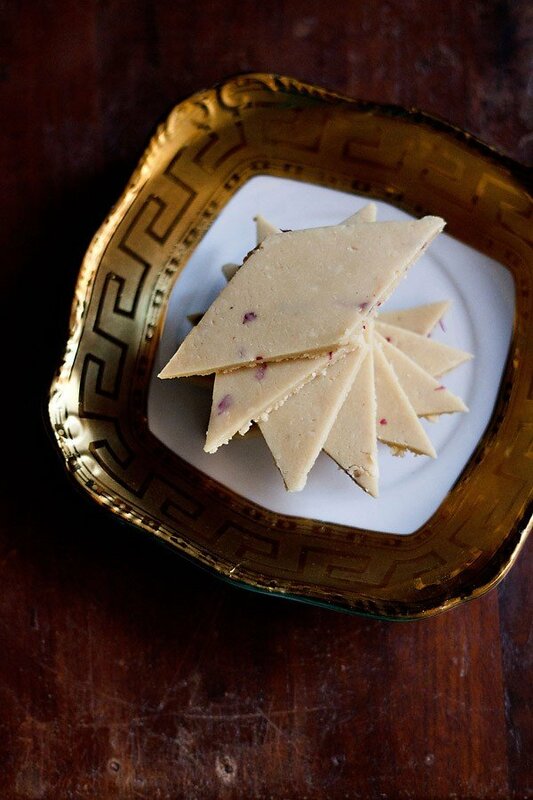 flatten the kaju katli dough and place it on a butter paper or on a greased plate/thali or tray. 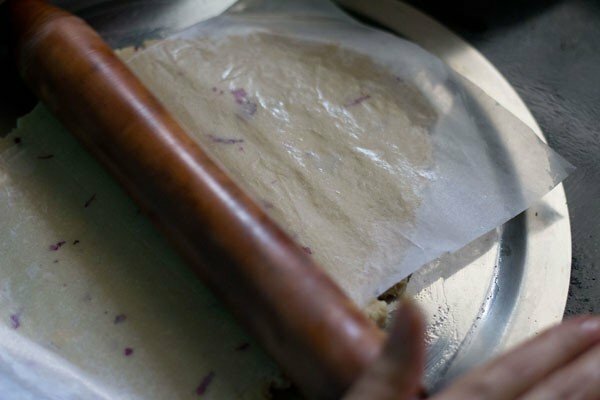 remove the butter paper and let the rolled kaju katli dough cool. 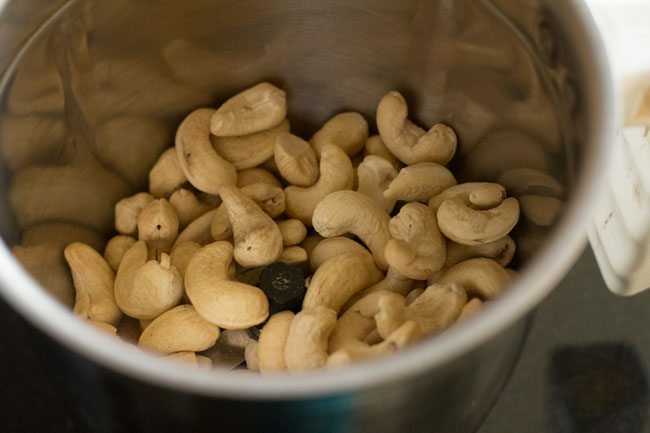 1: take 1 cup cashews/kaju in a dry grinder or coffee grinder. i usually keep cashews at room temperature. hence the cashews are dry. avoid using refrigerated cashews. 2. grind the kaju to a smooth powder. make sure you don’t over do the grinding process as oil should not release from the cashews. i ran the mixer at a stretch first and then scraped the sides and ran again at intervals for a couple of times. the cashews should be in powder form and not become pasty. if there are tiny pieces in the cashew powder, then just let it be….. or you can also sieve the cashew powder and keep aside. use a medium fine sieve and not a fine one to sieve the powdered cashews. 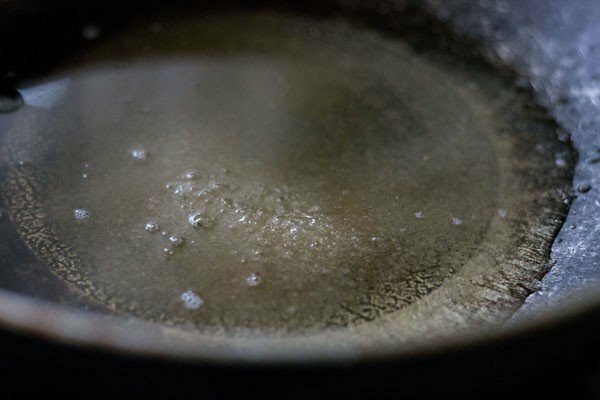 3: take ½ cup sugar (or as required) and 5 tbsp water in a thick bottomed pan (or kadai or a non stick pan). 4: keep on low flame and let the sugar dissolve in the water. there is no consistency in the sugar syrup like one string or two string. just let the sugar dissolve in the water and then proceed with the next step. 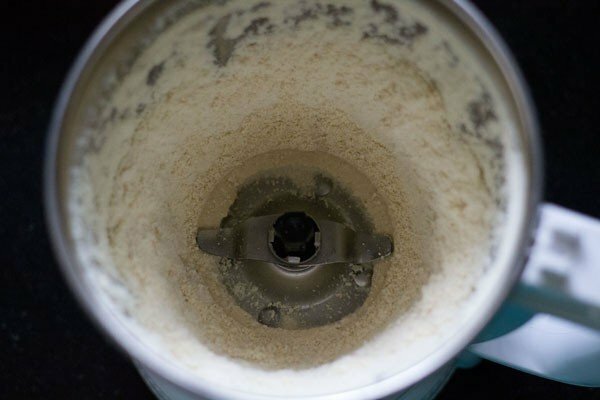 5: when the sugar completely dissolves in the water, add the cashew powder. 6: stir and keep on stirring and stirring on a low flame. if there are lumps then break the lumps as you stir and continue to stir. 7: the mixture would start thickening and almost come together. 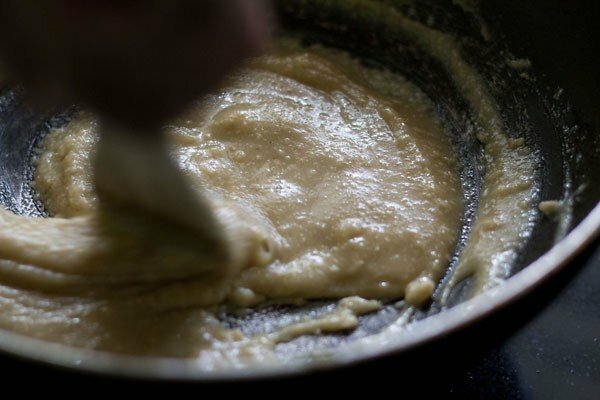 when it starts coming together in one form and starts looking like a very very soft dough… its time to remove the whole lump of the mixture from the pan and place it on a work surface. 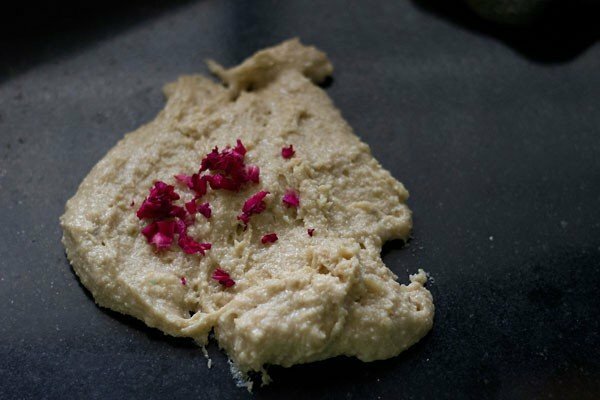 this process of getting the kaju katli dough took me exact 8 minutes on a low flame. 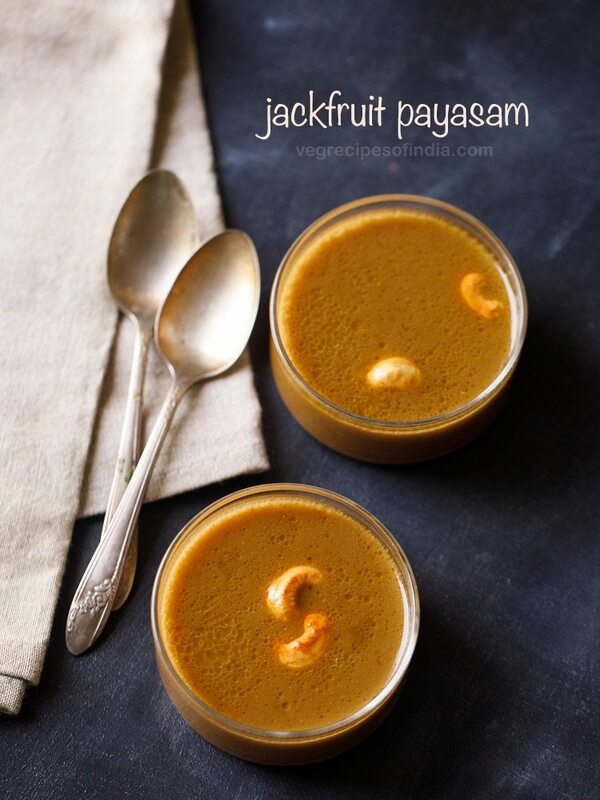 depending on your temperature, pan etc you can use a time span of 7 to 9 minutes after adding the cashew powder. 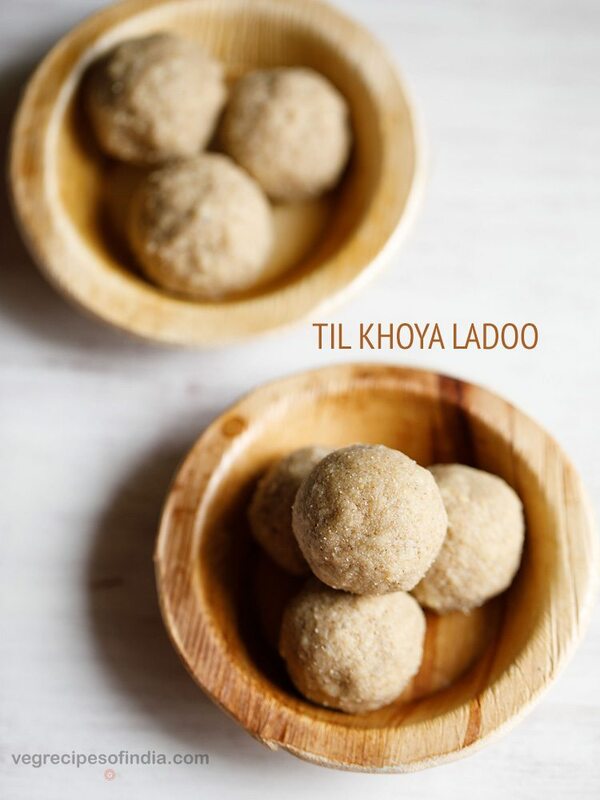 another way of checking is taking a small piece of the kaju katli dough and form into a ball. the ball should not stick to your fingers and be smooth. don’t even bother to scrape the edges. they are chewy. 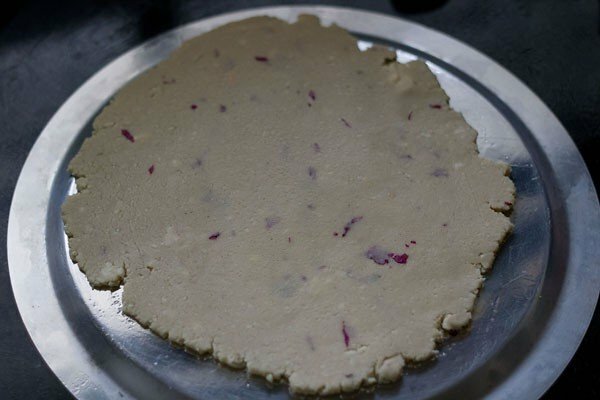 8: put the entire cashew dough on the work surface. add 1 tsp rose petals (or rose water or 8-9 strands of saffron) and 1 tbsp ghee or coconut oil. addition of rose petals and ghee are optional. 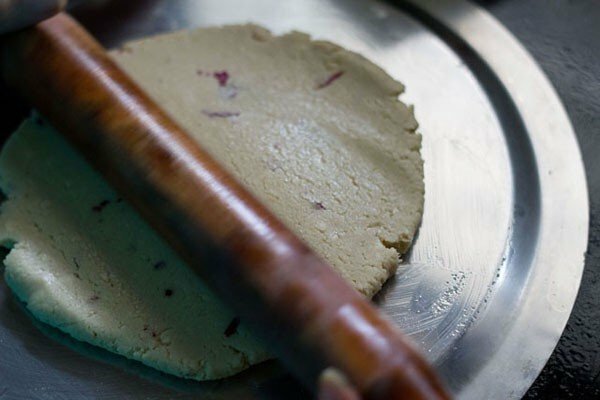 the dough would be very hot… so when the heat is enough to handle begin to knead the kaju katli dough. 9: knead the dough lightly. don’t over do as this will release oil from the cashews. the grainy texture in the kaju katli dough goes away as you knead it. remember the dough should be hot while kneading. you can also apply some oil or ghee on your palms instead of adding ghee/oil separately. in case the dough is soft, then add a teaspoon of some milk powder. if the dough looks dry or dense, add a teaspoon of milk to soften it. 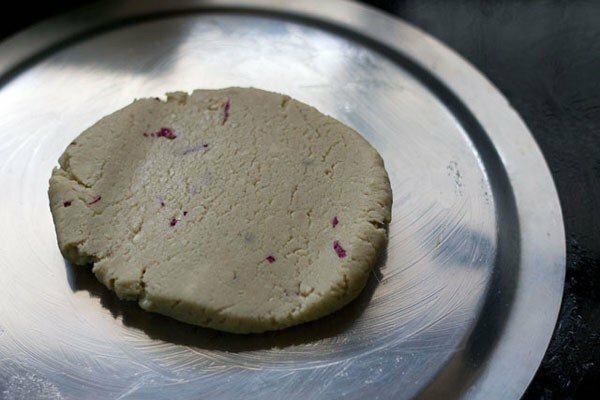 10: flatten the kaju katli dough and place it on a greased plate or tray. you can also place it on a large butter paper. 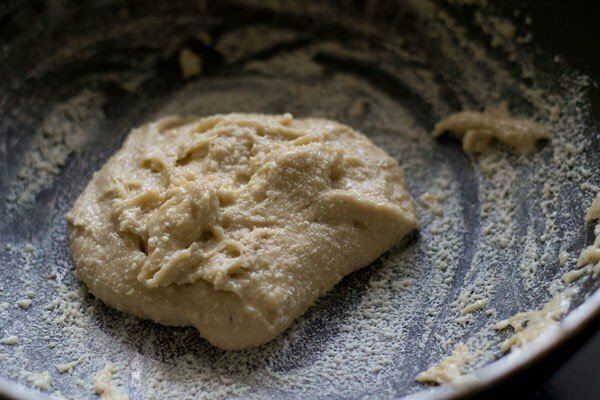 the cashew dough should still be hot or warm when you start rolling it. as it cools it will harden more and becomes difficult to roll. 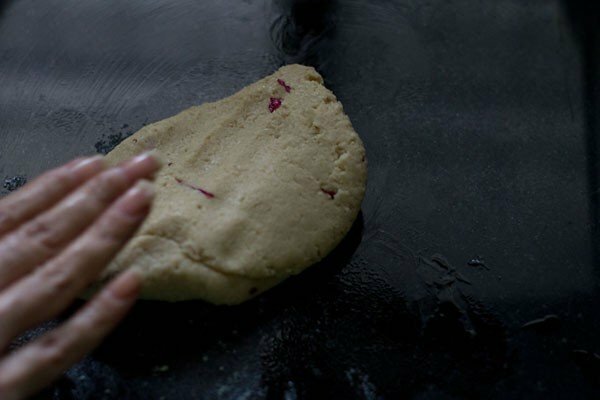 11: gently roll with a rolling pin (belan) to make it slightly even. there will be fine cracks on the dough. 12: to smoothen the cracks, place butter paper on top and roll more. this will smoothen the cracks and the kaju katlis will have a smooth appearance. 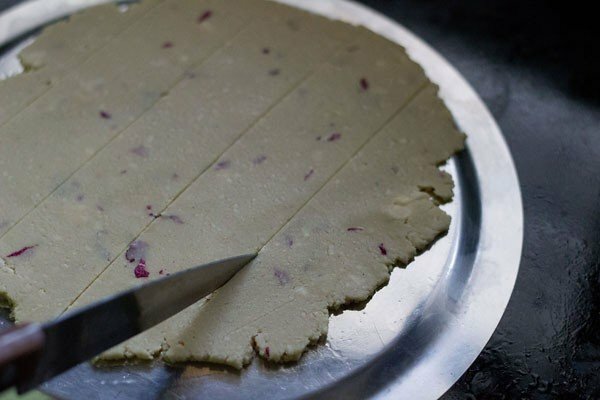 the cashew dough can also be rolled between two butter papers. 13: roll to get a thickness of about 3 to 5 mm. let the rolled cashew dough cool. 15: using a butter knife gently remove the kaju katli pieces from the bottom, taking care that they do not break. 16: remove and arrange kaju katli on a plate. serve kaju katli immediately or store them in air tight container. 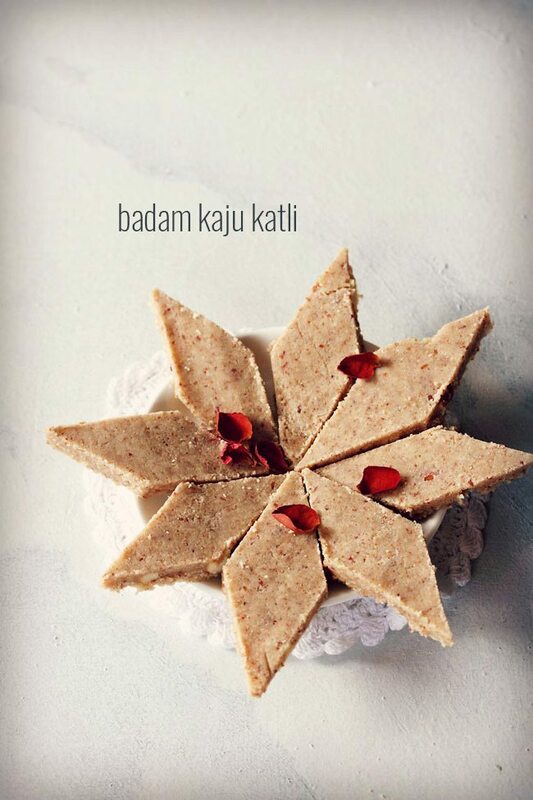 let me tell you, kaju katli will get over very soon 🙂 you can make kaju barfi for any festive occasion. another variation of this kaju katli recipe which you should try after mastering this recipe is kaju anjeer rolls (cashew fig rolls). they are also equally popular as kaju barfi. 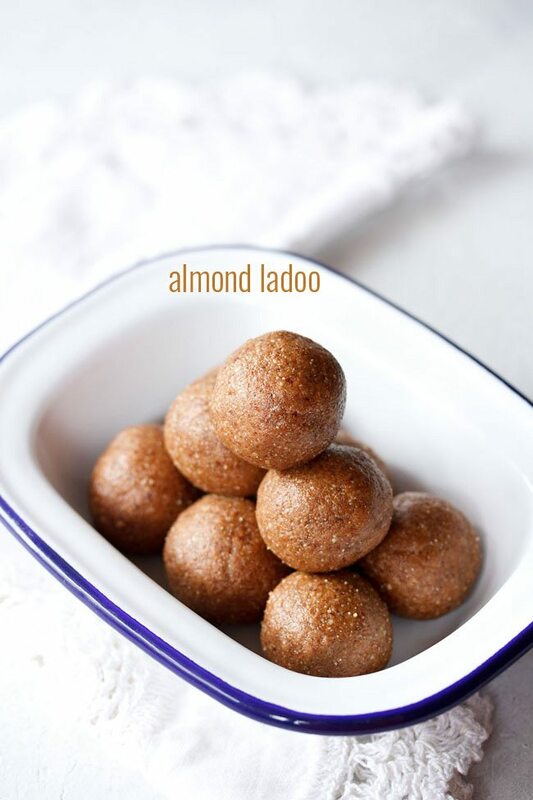 for more delicious sweets recipes you can check this collection of 121 sweets recipes for diwali. Thanks for the detailed recipe and tips for kaju burfi. I made it today and got it right the first time:) My kids said it is as good as the shop bought. Welcome Manjunatha. Glad to know that everyone liked this kaju barfi recipe. If I don’t have a butter paper to keep on the top for rolling what can you suggest? thanks neeraj. you can use aluminium foil. Okay, so just wanted to know if I can multiply the quantity of this recipe by 4. Do I just increase the ingredients fourfold? Alright, thanks for the disclaimer! sure mahika. do let me know. 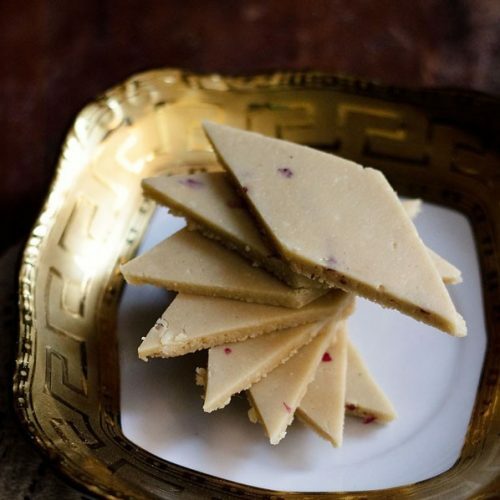 Hello, I tried the recipe, but I my kaju katli came out very soft, shiny, and sticky, just like peanut butter, its unable maintain its shape at all, could it be that way because I added 1 tblsp of olive oil instead of the ones you suggested? Should sticking to coconut oil make everything turn out right next time? Also after dissolving all the sugar into the water, should their be any consistency I should focus on? Anyways its still very delicious and my family loves it, I just wish it would keep its shape and not be so sticky so that I could give as gifts, or serve to my family. Thanks! carlos, the kaju katli mixture needs to be cooked more. so if this happens again then gather the entire mixture and cook stirring non stop for 2 to 3 minutes or till the mixture leaves the sides of the pan. olive is not an issue, so you can use it. after the sugar dissolves in water there is no consistency that is required. hope these suggestions help. Thank you so much for this wonderful and easy recipe !! I made it for the first time today and it came out perfect. My husband and daughter devoured it totally. The only problem that I faced while making the kaju katli was that it took a long time for the paste to become a dough (almost an hour). I followed your recipe word by word. But I don’t know why it took such a long time. I used an induction stove. Could it be because of that? Anyway, the end result was perfect, so I’m happy. Thank you once again !! thanks rashmi. could be due to the induction stove. it does not take so long on a gas stove. if the induction stove has less watts, then it will take time. anyways i am glad that the kaju katli recipe turned out good for you. Hi, In other blogs they make one string consistency for sugar surup!!! It’s that ok to add cashew in just a sugar syrup? i know. with one string consistency it becomes tricky as you have to cook the cashew powder for a few minutes. if you cook more the katli will become dense and hard. with this method you do have some time when cooking cashew powder and need not be in a hurry to switch off the stove top. Hi I didn’t have cashews so tried this with pistacio. Tasted like the pista katli I had as a child, but the squares looked greesy./shiny. What was the cause? I covered mine up with crushed pistacio but would like to know what to do to improve. 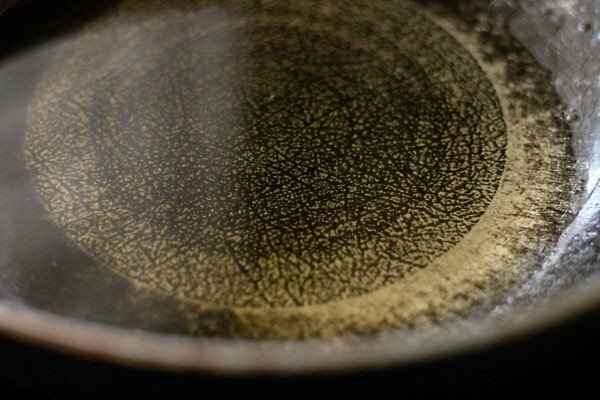 could be due to the oil released by the pistachios while grinding as well as cooking. thats why the shine and greasiness. I am a big fan of yours. Keep trying your recipes amd they always come out well. kaju katli stays good for a month in the fridge and for a couple of weeks at room temperature. making in bulk will require a lot of hand work. i do suggest to use a heavy kadai so that the mixing is easier and it does not stick to the kadai. to make work easier, you can also make in two to three batches on different days. reason being rolling that much of dough at one go is not easy. you will need some help by your side. alone it will be difficult to manage. Thank you for the recipe. Kaju has released oil while grinding. How can I fix it? 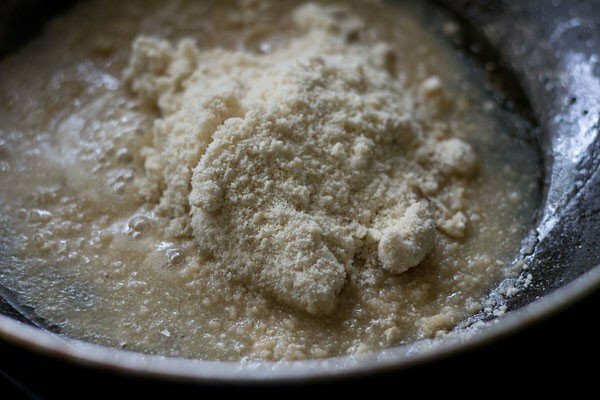 Can I add some milk and grind it to a smooth paste and continue with the recipe? Please help. I dont want to waste so much cashews. welcome shri. yes you can do this way. no worries. continue with the recipe. alternatively, when cooking cashews, you can also use some milk powder or khoya or mawa. condensed milk can also be used. 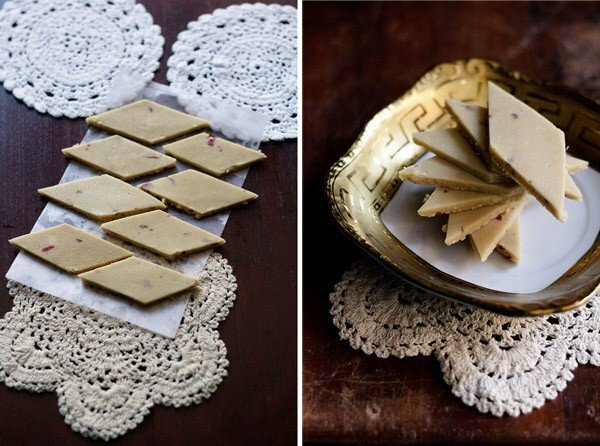 don’t make kaju katli, but make kaju barfi. you won’t get thin squares but you can medium to thick barfi like squares. eva, put it back in the pan. add some water (a few tablespoons) and continue to cook for a few more minutes. hope this helps.